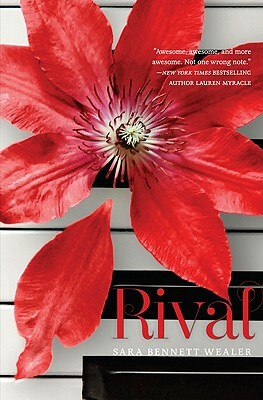 Rival by Sara Bennett Wealer. Grades 7+ HarperTeen, February 2011. 327 pages. Reviewed from ARC provided by publisher. Kathryn: Overachiever, outcast, incredibly talented singer. Determined to attend college despite her parents' wobbly financial situation, she knows that scholarships are her only chance. Instead of choosing between academic and vocal scholarships, she applies to everything and she knows it'll work out. As long as she can keep up the all-nighters. The Blackmoore: A prestigious singing competition held in Brooke & Kathryn's hometown. Winning means fame, jobs, admission to top music schools, and a cash prize. And there's only one first place spot. Brooke and Kathryn are facing off in the competition of their lives and they'll find out once and for all who's got what it takes. But before they were bitter enemies, Brooke and Kathryn were actually friends. What got them to this point and is there anything they can do to take it all back and make amends? Rival is a story about music. But it's also a story about friendship and the power of popularity and mistakes and misunderstandings. The story also alternates between the present (senior year) and the past (junior year), showing Brooke and Kathryn as rivals and then jumping back to show the rise and fall of their friendship. The entire story's bittersweet because Brooke and Kathryn actually had the potential to be great friends. They need each other. Brooke's surrounded by popular people, but her best friends don't understand her passion for music. Brooke's ready to jump ship and give up the popularity (and the pressure that goes along with it), but she can't quite figure out how to do it. Kathryn is a loner who only has one friend, really. When she's approached by the popular crowd, Kathryn gets swept up in fashion advice and slumber party invitations until she's inadvertently hurting the people she cares about. The story's told in alternate voices, letting the reader see both Brooke's side and Kathryn's side of the story. Sara Bennett Wealer does an admirable job of fleshing out both characters and explaining why they became enemies. Mistakes were made on both sides. Misunderstandings happened on both sides. Friends turned out to be not so friendly and unexpected allies appeared to save the day. This element of the story really struck a chord with me because I had a falling out with a good friend in high school and I don't think we ever talked again. The rocky terrain of friends and enemies is certainly something that many high schoolers are dealing with. I got into the drama, true, but where the book really shone was in the writing about music. You can certainly tell that Ms. Wealer is a singer herself and she describes the triumphs and tribulations of singing very clearly. More than once, I stopped reading to look up YouTube videos of the songs described in the story. Musical teens will see themselves in this story, but there's plenty here for musical newbies as well. I'd definitely hand this to fans of Glee. The combination of high school drama and musical competition will hit the right notes (har har) with Gleeks everywhere. I'd also try it teens who like theater and musical novels like Suite Scarlett by Maureen Johnson, Dramarama by E. Lockhart, or Good Enough by Paula Yoo. Read more reviews at Presenting Lenore and The Crooked Shelf.